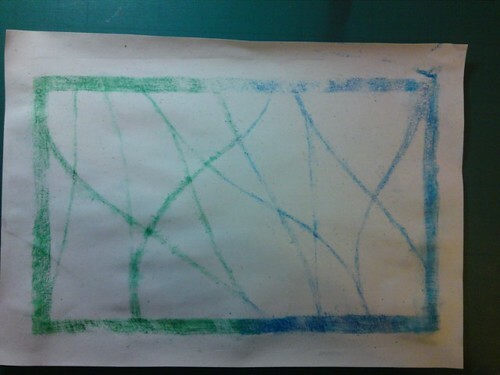 My first try at drypoint with watercolour pencils has given fairly encouraging results. Not very attractive, but then the idea was to answer the question, Can I print in watercolour without a press?, and it’s definitely that. This is my first time working with a drypoint needle, so one of the things I learn from this is that I have to use it much more authoritatively. It’s a great deal like using a pencil, and lack of pressure is one of my besetting sins when doing that, too. On the other hand, these transparent plastic plates are wonderful, and I’m already planning several things involving tracing images through them. Well, mostly wonderful – it’s difficult to see where your lines are going without strong direct, and preferably low-angle, light on your workpiece, so that’s going to take some getting used to. I only have a set of very low-end watercolour pencils, so that’s not going to give ideal results, but they’re still giving quite good transfer to the plate. The scratched portions have about as much tooth as rough paper, but the unscratched portions have none at all, so it’s really easy to confine the colour to the correct areas. When printing, I used Ellie Poo paper, since I had some A4 sheets of that lying around ready to hand; I sprayed it thoroughly with water, and wiped off the surface excess before laying it on the plate. As you can see from the smear in the corner, the water doesn’t glue it down in the same way that printer’s ink does, so that’s going to take some getting used to. More relevant, though, is that wet 90 gsm paper is very prone to wrinkles and distortion when rubbing (I was printing with a spoon – really ought to use a press, but I don’t have access to one) so it’s important to rub only from the centre outwards, rather than back and forth across the paper as I normally do. Next time I try this, I’ll do a test with some Ingres paper and with some actual watercolour paper – that’s designed for precisely the same distortion problem, after all.